Most of you, if not all, already know about kombucha. You probably already know a lot about what it is, what it claims to do and what it claims to heal. you’ve most likely heard plenty about its miraculous effects on the human body. Yeah, sure you know better than to totally deep dive into the hype. But just how much of that is factual evidence and how much of that is false logic? Is the hype purely commercialized or is there some truth to the miracle serum that some believe it to be? If you’re thinking, “It’s a fermented drink that contains probiotics thus it can cure cancer,” then it might be time to do a little more research. We’re here to dispel any myths surrounding kombucha and reveal the truth about this concoction that is hitting the market by storm. If you look up ‘death by kombucha’ you’ll most likely come across the case of two Iowa women found dead in 1995. They both drank kombucha daily and both women drank kombucha made from the same original SCOBY. But here’s the kicker: so did 115 other people and they turned out just fine. Ultimately, there are too many variables to label kombucha as 100% safe, but there’s no evidence to pin it as a harbinger of death either. It’s up to the individual to gauge whether the benefits outweigh the risk of bad side effects. Any adverse side effects or illnesses are most likely to arise from non-commercial kombucha made in the home. So will kombucha kill you? Chances are you’re going to be safe from the boatman. Will it make you sick? That’s a likelier scenario than death, but all things considered, not a very likely option either. The FDA, surveying commercial producers, has found no pathogenic bacteria or hygiene violations. It is possible that the home-brewed version becomes contaminated by other more pathogenic bacteria or yeast. A survey of home-cultivated Kombucha revealed massive contamination with Penicillium spp. in one case and Candida albicans in two. When the tea is prepared as directed, the pH becomes 1.8 in 24 hours, which should prevent the survival of most organisms. Because of its acidity, the tea should not be prepared or stored in ceramic or lead crystal containers, as toxic elements can leach into the tea. Drinking 4 oz of this “mushroom” tea may not cause adverse effects in normal persons. Potential health risks are unknown for those who have preexisting health problems or drink excessive amounts. OK, this is highly unlikely unless you drink some questionable homemade concoctions. Even then your chances of getting drunk are next to nil. Yes, kombucha contains mild amounts of alcohol, but in no way can it get you severely buzzed like some claim. Just ask Jules Suzdaltsev. This guy went on a mission to test the alcoholic limits of kombucha, only to discover that the results were less than pleasant. According to Brian A. Nummer, the alcohol and acetic acid content is normally kept under 1%. It can reach as high as 3% during longer fermentation times. Although as a general rule under the FDA, bottled kombucha that you’ll find in stores will only have trace amounts of alcohol below .05%. The process goes a little something like this: sugar converts to alcohol which then converts into acetic acids. The remaining .05% – 3% alcohol is what’s leftover that hasn’t converted into acetic acids. You could drink 5 bottles of kombucha and not even feel a buzz. So the answer is no, kombucha cannot get you drunk despite how hard your employees might try. Next time you’re deciding what drinks to stock up on, consider ordering kombucha for your office. Actually, think of kombrewcha as the reckless twin to kombucha who likes to live life on the edge. In other words, no they’re not the same. Kombrewcha is a new kind of hard kombucha with a higher alcohol content of 3.2%. 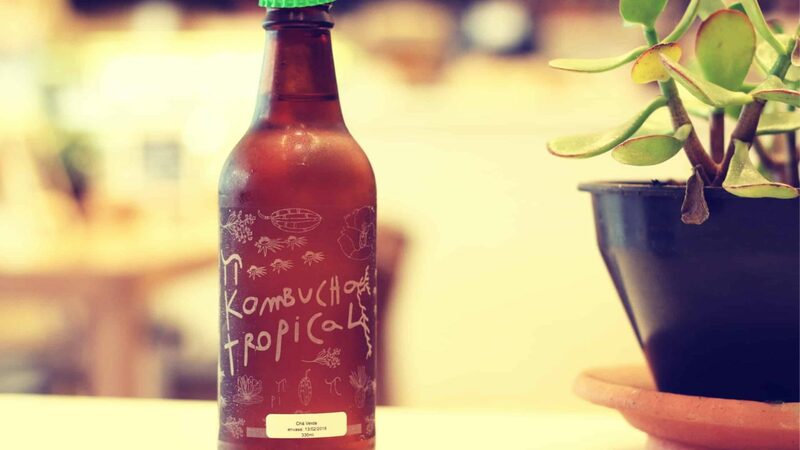 Declaring itself the ‘healthier’ alternative to other high-calorie drinks, they’re a new trend in the kombucha market that shows a fun side to the drink. Sure they have B vitamins. But not as much as you may think. In a research study done by Michael Roussin, he acknowledges a very minute quantity of B vitamins. When compared to other food items like milk, for example, Kombucha has just about the same amount of micronutrients. So what if it’s not the grand supplement that some may will it to be. It has beneficial properties and can hold its own when compared to other healthy food items. This is also a false statement. Once again, beware of the alleged assumption that kombucha will make everyone feel better. This is untrue for one of two reasons. The first being due to the healing crisis theory. Next question you’re probably asking yourself is what on earth is a healing crisis? A healing crisis refers to any worsening conditions that come from a change in diet or treatment. The belief is that once these symptoms subside, only then will a person start to feel better. However, in some cases, those symptoms never resolve themselves. When it comes to probiotics, they can contain dairy-based allergens. This can trigger a person’s auto-immune responses and disrupt the balance. The second reason why kombucha may not make everyone feel better is due to histamine intolerance. The main cause of histamine imbalances is due to fermentation and deteriorated foods. Our bodies are hard-wired to handle excess histamine but some people have what’s called a DAO deficiency. This prevents those people from processing histamines like the average person should be able to. With about 50% of histamines metabolized in the gastrointestinal tract, fermented items will only make the histamine imbalance worse. In this case, people with histamine or yeast intolerance should steer clear of the fizzy drink. At the very least they can reduce their intake of kombucha and slowly gauge their histamine tolerance. Correction: kombucha contains sugar and caffeine despite the fermentation process. Sugar is the basis for the fermentation process. Without it there would be nothing to ferment and kombucha would have none of its helpful qualities. It stands to reason that there would be residual sugar left after the fermentation process. And although fermentation does cut down on the natural caffeine content of tea, about one third is leftover. Look at it this way. If you had to choose between soda and kombucha, what would you choose? Soda on average has over 30 grams of sugar and caffeine whereas kombucha has anywhere between 3 to 8 grams of sugar and 6 to 14 grams of caffeine. Suffice to say, if you’re worried about your sugar and caffeine intake, kombucha will always be your best option. You know better than to buy into what everyone says about it curing just about any kind of disease you can think of. This belief that kombucha is a magic remedy may take root from its ancient origin. Thought to have originated from China in 221 BC, kombucha goes by many names, all declaring the same thing. It’s known as a miracle elixir, tea of immortality, drink of life, you name it. It’s used to treat patients with all types of disorders from cancer to the common cold and everything in between. And this is a belief that people to this day have been carrying over despite there being no definitive evidence that kombucha is as miraculous as it claims to be. There have been so many cases of beneficial outcomes that it would be difficult to disregard the truth in some of these claims. Kombucha beverage is a source of bioactive components, such as polyphenols and glucuronic acid. The beneficial outcomes of kombucha consumption are attributed to the synergistic effect between these components, making it a drink with potential beneficial health properties (when elaborated under adequate sterile conditions). All evidence aside, there’s nothing to stop you from drinking kombucha on a daily. If you believe it helps your energy or if it helps you sleep at night then, by all means, keep drinking it like it’s the blood of Jesus. Unless you’re more of a coffee person. In that case, a good supply of coffee at home or in the office would do you more good. As science uncovers more about the components of our alleged elixir of life, we unearth the truths about how kombucha affects the human body. The shroud of divinity falls to the wayside in favor of something more normalized. We start to debunk the myths and throw away the rumors surrounding the never-ending craze. Kombucha: The Elixir of Life will simply become, Kombucha: A Mighty Fine Good Tea. It doesn’t matter if you’re enjoying it at home or enjoying kombucha in the office. This trendy beverage is worth giving a try for yourself. It doesn’t have to save your life for you to claim it as your own ‘miracle elixir’.